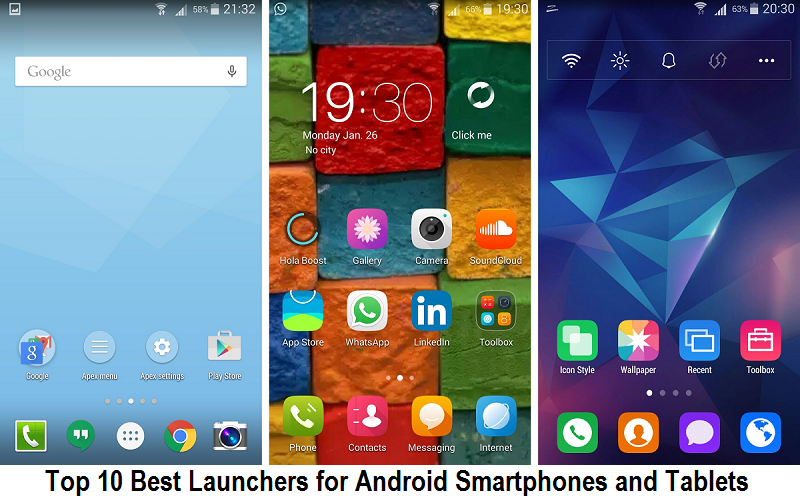 Google Play Store has several Android Apps based on launchers, but to choose amongst the best and worst is quite difficult for Android smartphone and tablet device users, so today we are writing this post to let our readers and followers know about the Top 10 Best Launchers for Android platform. Here you can find the top 10 list of android launcher with free download links, as well as detailed comparison review of features and functionalities. Android Launcher Apps is the best way to customize and personalize device look, feel and appearance with change of UI, UX, colors, icons, wallpapers and design with attractive and appealing themes. Custom Gestures, Smart, Customize Phone, Booster for Android, Personalization, Clock and Weather Widget, Launcher Theme, HD Wallpapers, Security Apps, Transition Effects, Icon Pack, Multiple Languages etc. Smart Folders, Priority Apps, Weather Forecast, Screen Lock, Notifications, Intercept, Personalize Search, Hola Box, Hola Boost, Hola Shine etc. Multiple Languages, Smart Sorting, Hide Apps, Safe, Personalized, Speedy, Brand-new 3D Transition Effects etc. Unread Count, Power+, APUS Market, Free Swipe, APUS Search, Smart Folder, APUS Personalization, APUS Discovery, APUS News, APUS Know, APUS Boost, Informative, User-Friendly, Battery Saver, Better Performance, Personalization etc. Search for Information, Clean & Boost, Quick Gestures, DIY with Photos, Beautiful Themes, Beautiful Wallpaper, Solo Now, Visualized Settings, Smart Widgets, Smart HomeScreen Icon Management etc. More Personalized, Efficiently and Intuitively, Smart Search, Fast Operations, Safety and Security etc. Several Languages, Performance, 3rd Party Icon Pack Support, Customizable Dock, Widgets, Recent, Reminders, Apps etc. Quick Access, Swipe, App Suggestions, A-Z Apps List, Say “Ok Google” etc. Widget, Transition Effects, Store, Apps Management, Personalized, Slim, Smart, Stylish, GO Launcher Z, GO Launcher EX etc. Scroll Effects, Icon Swipes, Hide Apps, Custom Drawer Groups, Unread Counts, Gestures, Fast, Import Layout, Widgets in Dock, Scrollable Dock, Backup/Restore, Infinite Scroll, Improved Widget Drawer, Customize App Drawer, Color Controls, Subgrid Positioning, Icon Themes etc.